One of the reptiles at the Living Coast Discovery Center. 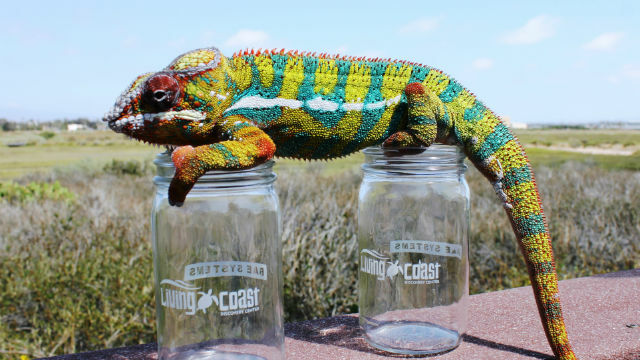 The Living Coast Discovery Center, a zoo and aquarium on the bay in Chula Vista, will host its 8th annual Farm to Bay culinary celebration on Saturday. The unique tasting event from 4 p.m. to 7:30 p.m. on Aug. 5 brings together some of the region’s finest restaurants, breweries, wineries and farms to raise funds for the center’s wildlife, education and sustainability programs. Among the dozens of food and beverage purveyors lined up for the event are Sushi on a Roll, Catalina Offshore Products, Bay Bridge Brewing, Daniela’s Kitchen, Chula Vista Brewery, Jimbo’s Naturally, Amore Cheesecakes and Suja Juice. This year the event will also honor Supervisor Greg Cox for his contributions to the center. Farm to Bay is the only San Diego food and wine tasting set within a protected national wildlife refuge, where guests can sample culinary specialties alongside dozens of native animal species. Tickets are available online at $100 per person.